When atoms interact things can get interesting. Fundamental research on the fundamental properties of materials and nanostructures and exploration of the potential they provide for applications such as lasers, solar cells, super strong magnets, biosensors and devices for emergent quantum information technologies. Atom-scale chips may sound like science fiction today, but it seems more than likely that the computer chips of the future will be working with structures comprising just a few atoms. To make this leap forward, however, physicists need to develop new materials and production methods, and gain a new understanding of the processes that take place in semiconductors. And this is exactly what Alexander Holleitner and his team are doing. Bild: TUM/Eckert. The research area of condensed matter physics represents one of the most diverse and active areas in all of natural and applied sciences. Research is driven by numerous fascinating and unexpected phenomena that arise from the complex interactions between the large numbers of constituent atoms or molecules in the solid state. The understanding and control of solids, complex processes that occur in two dimensions at interfaces and the properties of nanostructured devices and machines require the utmost care, both for their experimental investigation and theoretical description. In particular, the knowledge gained is used to develop new types of functional materials and devices with tailored properties in diverse fields ranging from photonics, electronics and spintronics. Spokesperson of this research area is Martin Stutzmann. 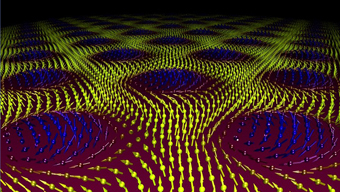 Spin crystal of magnetic vortex lines. Photo: TUM.PH/Pfleiderer Lab.The physics of condensed matter is concerned with the expression of the natural laws of objects whose components are continuously in contact and are subject to a resulting interaction. In particular, this includes the description of complex systems in which, due to the large number of atoms and electrons, idiosyncratic phenomena arise. The scientific spectrum ranges from fundamental questions about the building blocks and symmetries of materials up to the solutions of technical challenges based on novel effects. Not without reason, many epochs of humanity are named after certain materials. For example, the 'silicon age' was established by research on semiconductor properties that became the basis for the microelectronic revolution. From the standpoint of physicists, the field of condensed matter offers a wealth of prime examples of so-called cooperative many-body systems. In these situations, the collective properties of systems of interacting atoms and molecules lead to special electrical, magnetic, optical, thermal, and mechanical properties, which cannot be predicted easily, and their description requires special concepts. 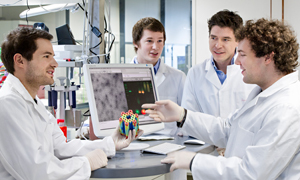 Thus, the physics department's research activities deal with, for example, self-ordering phenomena and the electrochemical properties of interfaces, magnetic phenomena and macroscopic quantum phenomena, such as superconductivity in bulk materials and nanoscale systems, and also coherent effects in solid-state quantum systems. An indium arsenide quantum dot on a Gallium arsenide surface. The conversion of light to electrons can be examined and controlled for applications in information technology as well as energy science.The functionality of materials is determined by the organization of the individual atoms and the interaction of the electrons in the many-body system. For both basic research and technological applications, it is therefore essential to be able to control and manipulate the spatial arrangement of the atoms on macroscopic length scales and material interfaces at the atomic scale. This also applies to transition metals and oxide compounds of rare earths, to multi-ferroics, and to semiconductor materials such as Si and GaAs and their hetero- and nanostructures. In addition, hybrid architectures of crystalline and soft matter as well as organic and inorganic materials offer the possibility to combine the physical properties of different materials and therefore to generate novel functionalities. The applications of functional materials ranges from diverse sensors and detectors; through photovoltaic and catalytic cells for energy conversion and storage; to metallic, superconducting , magnetic, spintronic and semiconductor-based circuits for information and quantum information technology. 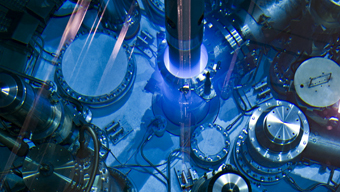 A view into the reactor vessel at the heart of the Munich Neutron Research facility FRM II: Cherenkov emission is observed as the blue glow in the water surrounding the reactor core.The development of special materials preparation and fabrication methods and specialized instrumentation and measurement techniques play a key role in all experiments in condensed matter physics. Methods are continually updated and refined in the Physics Department of the TUM to stay close to the forefront of the state of the art. Innovations across many sub fields contribute to solving fundamental problems in nature and condensed matter physics, whilst posing a few new questions as well. 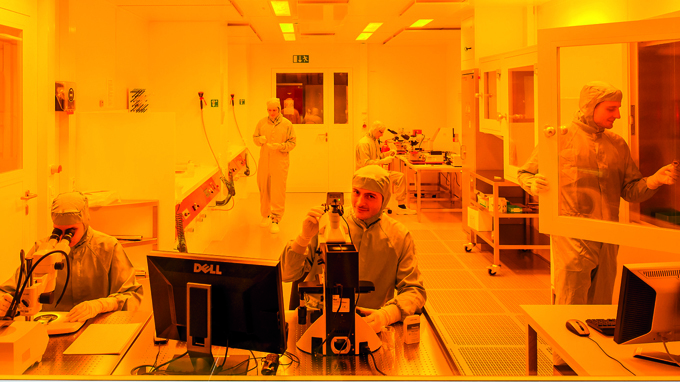 In the laboratories of the Physik-Department of the TU-München a broad palette of methodologies, instrumentation and experimental approaches are used including; intense laser sources used to excite electrons in solids and probe physical processes in real time, measurements performed at ultra low temperatures and high magnetic fields. In other research the surfaces of solids are imaged and manipulated with atomic resolution and diverse nanofabrication facilities allow the fabrication of nanostructures using lithographic methods. 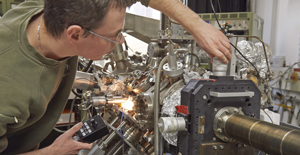 The nearby neutron research source FRM II and its associated unique capabilities for neutron metrology is also of central importance to research in condensed matter physics. Here, this partially unique facility allows neutrons to be used in modern scattering spectroscopy, for high-resolution neutron tomography studies and time resolved radiography experiments. In addition, the interpretation of data provided by such highly developed methods and generation of new knowledge calls for sophisticated theory and multi-scale modelling.